You’ve told us that there are issues with our Local Offer for children and young people with special educational needs and disabilities and their families. We’re in the middle of developing a new Local Offer and we’re working in partnership with South Glos Parents and Carers to do this. Thank you to those of you who attended the sessions that were held in September 2018. At the sessions examples of other Local Offer websites were reviewed. We received some really helpful feedback about these and what people wanted from the look and feel of a new look website. Some of the feedback we received is shown below. At the end you’ll find a link to the websites we looked at. Where are things up to now? working on the website design and structure. The SEND Local Offer will be one of the channels for our new website for children, young people, families and older people. reviewing the content on our current Local Offer and identifying gaps in information. looking at how people search for advice and guidance so we make it as easy as possible to find helpful information. identifying service related information available in the community so we can develop a directory of services. This will develop over time. 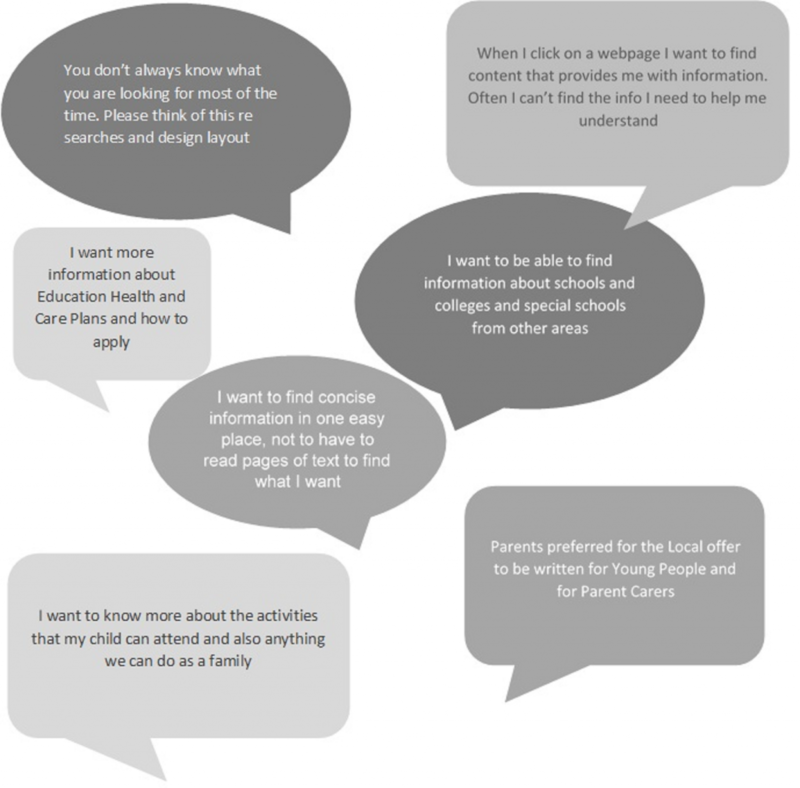 We’ve also had a small focus group in January 2019 looking at the name for the site and some user journey stories exploring how people access information they need. We asked for suggestions for a name and with the help of the focus group we have decided on South Gloucestershire LIFE – Local Information For Everyone. How long will it be until the new website is available? Over the next few weeks we aim to finalise the design, with plans for the new website to be built from May 2019. Content will be uploaded from June 2019 and the site tested with a small group of users. We’ve been doing some research to work out which is the most popular information that people are looking for and start adding this to the website first. Following the September consultation event and the January focus group we enlisted some volunteers who want to help test the website so we’ll be asking for their help then. We’ll start to increase the number of people who have access to the website as the project progresses. We plan to launch the website properly from September 2019. We had planned for the SEND Local Offer to be launched much sooner than this. However the delay is due to it being part of a wider website. It made sense for us to look at the SEND Local Offer requirements as part of the bigger picture. We’ll ensure that we add any more updates to this page so you can see how things are developing. Thank you for your patience whilst we improve the SEND Local Offer and thank you to those of you who are supporting us with this work. What websites did you look at in September?